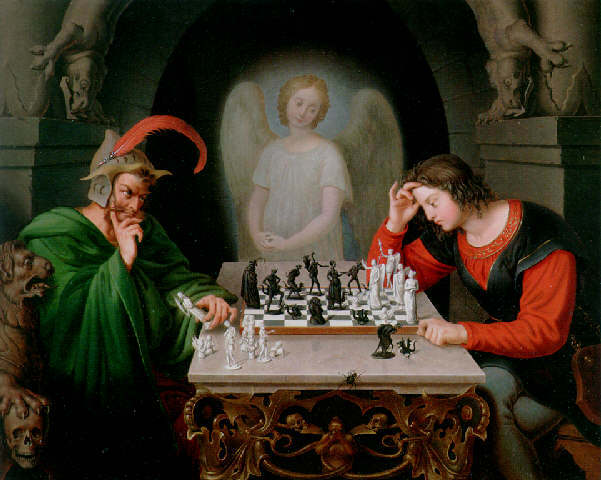 A man was touring the Louvre with his friend who happened to be a chess grand master. They moved along the corridors and rooms admiring the many great paintings and works of art that were on display. And so it is that Easter 2018 is now truly past and we must move on. We quickly forget the wonder of the Resurrection, of the emotions of holy week, and get absorbed in our everyday lives. We will watch or listen to the news and hear stories that are discouraging, depressing, and yes, even terrifying. The joy of Easter Sunday yields quickly to the fears of Good Friday and the darkness of Saturday, and we start quickly to lose hope and joy. I hope that this year, whenever you start to lose hope, to get discouraged, to be terrified, when joy begins to fade, that as you face the events of your day that you will remind yourself that the King has one more move. Nothing will stop Him from making that move for he is not just the King, but He is Almighty God and His will prevails. He rules the nations with a rod of iron. When He makes what is truly the final move, the victorious last move, that “Easter” morning will never turn into another burdened Monday but it will last forever. Remember: the King has one more move! PRAYER: Jesus, we have rightly celebrated your glorious resurrection. Now we face Monday – a Monday like all the others where we will be challenged on every hand. We will be prone to disillusionment and even despair. We may even think the game is over and all is lost. Remind us, every day, every moment, that You have one more move! In Jesus’ name, Amen. DayBreaks for 7/21/16 – Get Your Toes in the Water! Exodus 14 recounts an amazing moment in the history of God’s people. Get the picture clearly in your mind: Moses, an itinerant shepherd for the past 40 years, has gone to Egypt and told the most powerful man in the world, Pharaoh (by the way – many think that the pharaoh of the exodus whom God humbled was none other than Ramses II, the greatest and most powerful pharaoh of all time), to let his fellow Hebrews go. After a test of wills between God and pharaoh, Ramses gives in and the people leave. The children of Israel head east, being led by God in that direction. In the distance Moses starts to see a shimmering that looks like water, but initially he probably wasn’t sure whether it was water or a mirage. But, with each step it starts to look more and more like water. Soon – he’s sure. And it isn’t a little puddle, either. We’re talking serious waves here! About the same time, Moses starts to hear the sounds of warriors, chariots and hooves behind him, and the angry shouts of the Egyptian soldiers out to take revenge on the Israelites for the deaths of their firstborn sons. The Israelites start to cry out to Moses, “What have you done to us by bringing us out of Egypt?…It would have been better for us to serve the Egyptians than to die in the desert!” They were catching a vision, too – a vision of their bones bleached dry in the desert sands by the Red Sea. Are you stuck between the proverbial rock and the hard place? Are you at a standstill in your walk with Him? Have you been praying and then sitting back to see what God was going to do, instead of praying and moving forward? God will act – but not until you move forward in faith that He will act. The seas were parted, but the children of Israel still had to move forward in faith through the towering piles of water. God has heard your prayers – now He is watching to see if you’re going to move! PRAYER: Father, we want to be spectators too often in the church and in matters of faith. We want to watch You do spectacular things, but only when our neck isn’t on the line or we don’t have anything at risk. We want to see You move first. Help us to know that once we’ve committed our way to You in prayer, since You’ve promised to hear and answer, to discern Your voice and then move forward into the waters of deep faith. In Jesus’ name, Amen. Copyright 2016, Galen C. Dalrymple. All rights reserved.